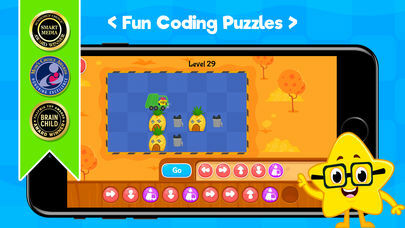 ‘Coding Games for kids’ is a unique application that teaches sequential visual coding. 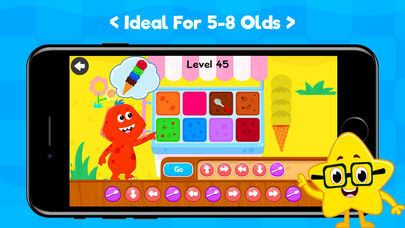 The app comes with an array of free games and encourages children to solve problems, improve logical thinking and increase their memory in a fun and interactive environment. This app does contain adverts to promote the subscription service. There are in-app purchases available at several stages for further access to monthly and yearly subscriptions as well as individual coding topics. Upon opening the application, the user is given an introduction to the application and its features. The introduction explains the need to learn coding in today’s society and how this can help with problem solving and logical thinking. It is clear from the outset this application is very user friendly and it has a great childlike feel to it with colourful graphics and ease of navigation. The developers may consider this introduction as a chosen option rather than an opening scene as this may put some people of the application by being shown a subscription service at this point. The opening introduction will also play again if the application is closed fully and reopened, however, this can be skipped by the user. There is a parental number locked ‘Settings’ icon in the top right. This gives parents access to ‘restore purchases’, ‘add a discount code’, ‘more apps from the developer’ or to sign in using the Kidlo ID. Sequences - Here the command is executed exactly in the same order of events given by the coder. Loops - Loop is a concept for repeating a set of commands. Functions - Functions are a set of commands which can be used anytime as per the coder's wish or requirement. Debugging - Debugging is the process of finding and correcting errors in a given computer program. Arrays - An array is a collection of similar type of objects which is used to arrange things in a particular way. Advanced - Solving by a combination of the above commands. Coordinate - Learn the movements based on X & Y coordinates. When selecting the “Simple Sequences’ option the user is shown games that have been subscribed to as well as ‘free’ versions. The topic has numerous levels of difficulty with clear instructions that are shown at the beginning to help the user get started. The graphics are clear and colourful and large enough to move comfortably with a single digit. A simple ‘Play Again’ instruction is given if the user fails. 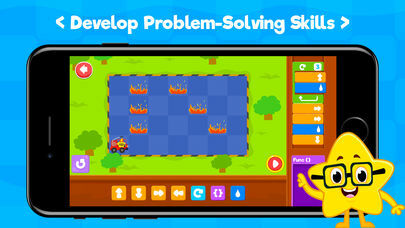 The second level does not include the guidance and enables the user to put into practice what they have learnt demonstrating progression in their coding skills. 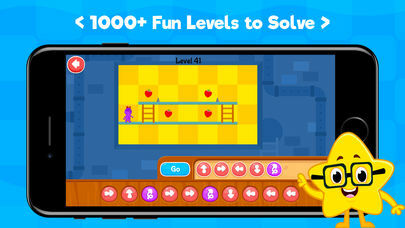 Once a level has been completed the user receives a little graphical celebration. If the application is closed the completion of levels are retained. 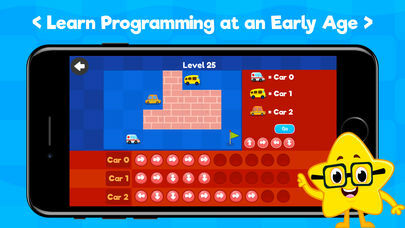 The ‘Little Fire truck’ is another sequential coding level. The music and graphics here are excellent and would really appeal to the younger user. 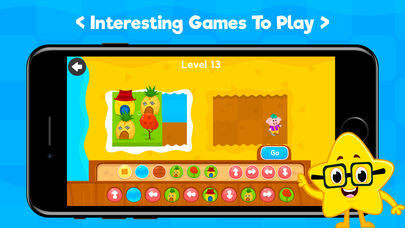 Our users found this easy to navigate and fun to play especially as the levels got harder by introducing obstacles. The developers could consider a printable certificate for the child to print and display in the classroom or home once all levels have been completed. We also noticed that levels need to be completed to progress to the next. Some users might find this frustrating so why not give them a taste of the levels. The user could maybe access levels 1,5,10 and 15. 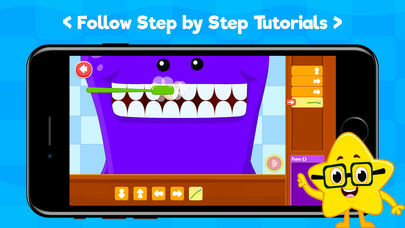 The ‘Loops’ section challenges the user even further but once again the tutorials are clear and precise to enable the user to advance without guidance. Even the loop function itself is easy to employ and understand by placing the sequences inside the loop and choosing a number to repeat. The ‘Functions’ section is also easy to comprehend and navigate thanks to the clear tutorial. 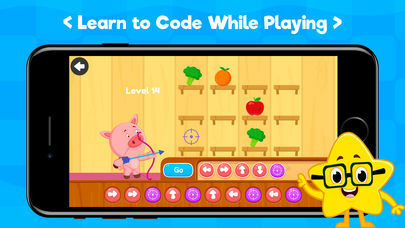 This enables the user to write a simple code and repeat by using the functions button. The ‘Debugging’ section is a great feature and one that we haven’t seen very often in similar apps. This promotes problem solving and logical thinking by getting the user to ‘debug’ programs by finding and correcting errors in a given computer program. Our users enjoyed this feature the most although it does become quite challenging at times. The ‘Advanced’ uses a mixture of the commands learnt. This is excellent as a stretch and challenge task for those users who are confident with the programming features so far. The ‘Arrays’ feature is a collection of similar objects which are used to arrange things in a particular way. The ‘coordinates’ feature is ideally suited to the Math curriculum also as this teaches the user how to navigate using coordinates X and Y. 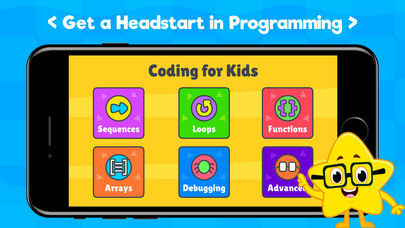 As schools move away from traditional Information technology to cater for the computer programming curriculum ‘Coding Games for Kids’ is an excellent application that will support this process. 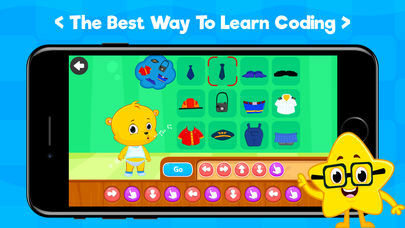 Please note that the application has good educational value as a free version, however, to really appreciate the apps coding power the subscription service is recommended. The sequence is the first step and most important part of coding. Here the command is executed exactly in the same order of events given by the coder.